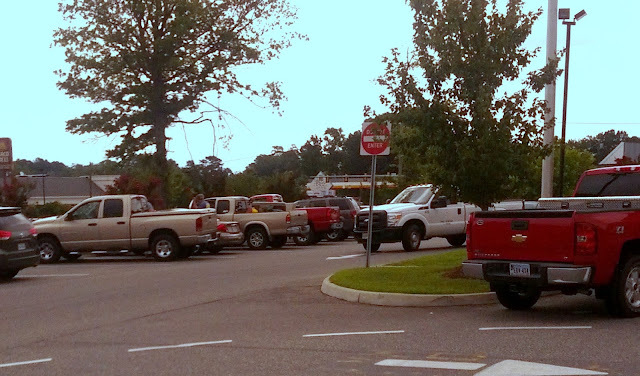 Gloucester VA Links and News: Government Truck Seen At Hardee's, Photo ID. This is a full size picture of Gloucester County government vehicle number 600 seen at the Hardee's today, July 29th, 2013 at 10:45 AM, in Hayes. If you look to the far left, you can see the corner of the Taco Bell sign across the highway. We cropped the other picture for vehicle identification purposes. This is the same vehicle seen at the Hardee's at the courthouse area at 7:05 AM this morning. Anyone care to bet that the employees all go to McDonald's or Burger king for the rest of the week? Maybe even Sonic's? Send us your pictures of wherever you see them using government vehicles for personal use. We will be happy to post them. We can give you photo credit or keep your name off the information altogether. Which ever works best for you. Government employees are not supposed to use government vehicles for personal use.